Singapore's ambitions to grow its cruise industry could be hobbled by shortcomings that prevent it from being a seamless experience, said ground handlers. Handlers, who manage disembarkation, embarkation and tours for cruise passengers, said hour-long waits at immigration points, bottlenecks at attractions, and a shortage of coaches and tourist guides make Singapore less attractive to cruise operators. 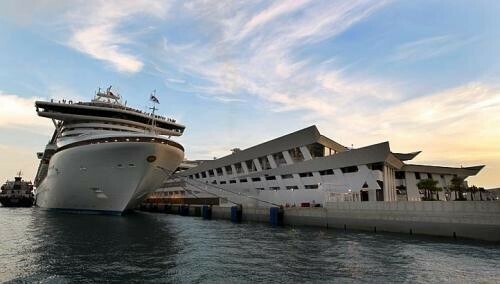 Cruise ships can disgorge up to 4,000 passengers at one go, or be boarding the same number simultaneously, they said. But the industry is also marked by seasonal falls and rises in numbers. "The clearance in our cruise terminals could be more efficient. Passengers sometimes wait in line for an hour to get out," said Mr Darren Tan, managing director of World Express. At other ports of call, passports can be stamped on board ahead of arrival so disembarking passengers "just stream through". "Could something be done to clear passengers faster?" he asked, speaking to The Straits Times on the sidelines of a Singapore Tourism Board (STB) industry workshop yesterday. Passengers go through the Marina Bay Cruise Centre Singapore at Marina Bay or the Singapore Cruise Centre at HarbourFront. Destination Asia's managing director, Mr Bob Guy, also pointed to a shortage of tourist guides and coaches, and the capacity at attractions and restaurants here. Shore excursions are often booked on the vessel, en route. "Many parts of the city run at more than 85 per cent capacity, so we have problems of things selling out," he said. "Cruise lines won't come because it is a bad experience for their passengers. We can't wait till 2016... these issues must be solved now." Handlers said attraction operators could be more flexible in blocking tickets for cruise passengers and even work with them in customising itineraries for cruise passengers, who tend to arrive at specific times in the day. The number of cruise passengers visiting Singapore has grown by 6.5 per cent annually over the past decade, hitting 913,000 last year, and is expected to reach 1.5 million by 2016. STB formed a Passenger Experience Committee in April to address concerns. Assistant chief executive of STB's business development group Neeta Lachmandas would not comment on specific issues but urged hoteliers, attraction and restaurant operators and retailers to work together to grow the cruise market, which is "not as evolved" as it could be. Some businesses have started to tap the growing market. Two months ago, budget airline Scoot began signing contracts with cruise agents here to block seats for passengers flying to Singapore to board cruise ships. "This comes with a certain degree of risk but it's worth it because these types of arrangements can deliver volume bookings," said Scoot's head of commercial, Mr Steven Greenway. Fairmont and Swissotel offer cruise passengers refreshments as they wait to check in. During peak season, these passengers make up 3 to 5 per cent of business, said Ms Ng Sok Hia, the hotel chains' executive assistant manager of sales and marketing.